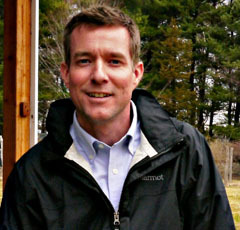 David Outman joined the Harvard Conservation Trust (HCT) as only its second Executive Director in 2015. Prior to joining HCT, David worked as a land protection specialist and conservation planner at The Trustees of Reservations (TTOR) for nearly a decade. During his tenure, he worked across the full range of Massachusetts communities from rural to urban, and applied a wide array of land-protection tools, from outright fee acquisition, to conservation and historic preservation restrictions, to deed restrictions and easements. David was TTOR’s lead on the Gateway Cities Project in Fitchburg that created a riverfront park and community gardens, and assisted in protecting the City’s expansive and remote northern water supply, watershed. A resident of Littleton, David is familiar with the Nashoba region area and has a special attachment to “place.” His experience brings myriad examples of how to work collaboratively with a host of community and organizational partners to carry out HCT’s mission. When not at work, he can often be found tending his vegetable garden are wandering the trails of Oak Hill and Tophet Chasm. As Executive Secretary, Julie handles many administrative tasks for the Trust. If you would like one of your photos posted on the Nature Sightings page of HCT’s website, or have a question about membership or other Trust issues, please contact her at the above email address. Julie and her husband lived in Harvard from 1995 to 2017, and their daughter graduated from Bromfield High School. Julie graduated from Bucknell University and holds a master’s degree in public administration from George Washington University.